In the heat of July, the Top Ten Scoreboard proved tougher then usual to break into, with the top score of July matching the ninth place score of June! The 56 points of our tenth place team in July is also the first time since September 2014 that there was a Top Ten score below 70 points (and even then, the tenth spot had 68 points)! After the third highest score of June, 5 Fast 5 Furious make their first appearance at the top of the pops, as 4th of July Fast 4th of July Furious! Their 124 points on July 4th, isn't just the high score of July, it also proves to be the high score at Hitch, and the ONLY high score from Hitch for the month. Just one day after the top score of the month was put on the board, the Cunning Stunts put up the top score at Lou Dawg's BBQ with 118 points on July 5th! 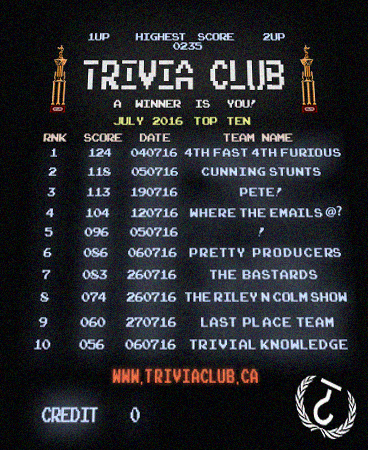 The Pretty Producers, a first time team, grabbed the top score at Cardinal Rule for the month, doing so July 6th with 86 points! It's the fourth month in a row with a Top Ten appearance by the Cunning Stunts, while David Bowie's Corporate Whores do not appear on the Scoreboard for the first time since January! In total, half the Monthly Scoreboard from July put up points in the week of July 4th to July 6th! Lt. Dance appeared three times on the Top Ten of July, as "Where the emails @? ", "! ", and "The Riley 'n Colm Show"... and surprisingly it was only their highest score that won them a Golden VHS in June! Of the Top Ten for July, teams at Lou Dawg's have six scores on the board, Cardinal Rule was three scores on the Top Ten, and as mentioned Hitch has only the top score. The eleventh highest score of the month, the nearest to July's Top Ten, was the 47 points that won the M. Night Shaym-Aliens the Golden VHS on July 20th. The Mean Team for July, with the high score closest to the scoreboard average, are Lt. Dance (as "!") with their 96 point take!